Megan practices intellectual property law with an emphasis on patent and trade secret litigation and counseling. She has worked on technologies from a broad range of industries, including pharmaceuticals, chemicals, and lawn care equipment. 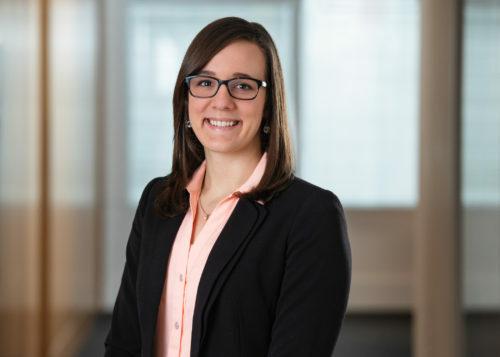 After obtaining her Chemical Engineering degree, Megan took a system engineering position at a leading U.S.-based global manufacturer of food brands. In that role, she served as a product line lead and managed a variety of research and development initiatives at the plant level. Her work with new products and technologies inspired her to earn her J.D. with a focus in intellectual property. While in law school, Megan spent two years as an intellectual property law clerk, where she gained valuable patent prosecution experience. Through her service on a committee for creating university policies that drive intellectual property creation, she developed an in-depth understanding of the legal landscape surrounding university research, technology, and intellectual property development. Megan is fluent in Spanish. She is passionate about community involvement and has served as both a mentor in the Big Brothers Big Sisters program and a coach for Girls on the Run.